This entry was posted in Book of Abraham and tagged Book of Abraham, Gospel Topics Essays, Pearl of Great Price, Translation and Historicity of the Book of Abraham on July 10, 2014 by claytonbhess. This entry was posted in Book of Abraham and tagged Manuals, Primary, Primary 5, Primary 5 Chapter 20 on July 9, 2014 by claytonbhess. This entry was posted in Book of Abraham and tagged Gospel Principles, Gospel Principles Chapter 10, Manuals, Missionary on July 9, 2014 by claytonbhess. Addendum: There is no factual way to refute that Joseph’s translation was incorrect, as confirmed by all notable Egyptologists. Arguments that the text is unrelated to the papyri are false because the text directly references the facsimiles and the facsimiles themselves were incorrectly translated. Meaning: From a secular perspective, the explanations provided from the church and its apologists are actual attempts at deception because they argue that adjacency of the text to the figures to which it alludes can be called into question, however, this does not negate the fact that the facsimiles are, in and of themselves, an incorrect translation, and that they are directly referenced in the text of the Book of Abraham. From a faithful perspective, belief in the doctrines expounded in the the Book of Abraham is a personal choice and cannot be refuted historically. Believing that the book could have been received similarly to how other revelations were received does not violate historical evidence. This entry was posted in Book of Abraham and tagged Book of Abraham, Gospel Topics Essays, Pearl of Great Price, Scriptures, Study Helps, Translation and Historicity of the Book of Abraham on July 8, 2014 by claytonbhess. 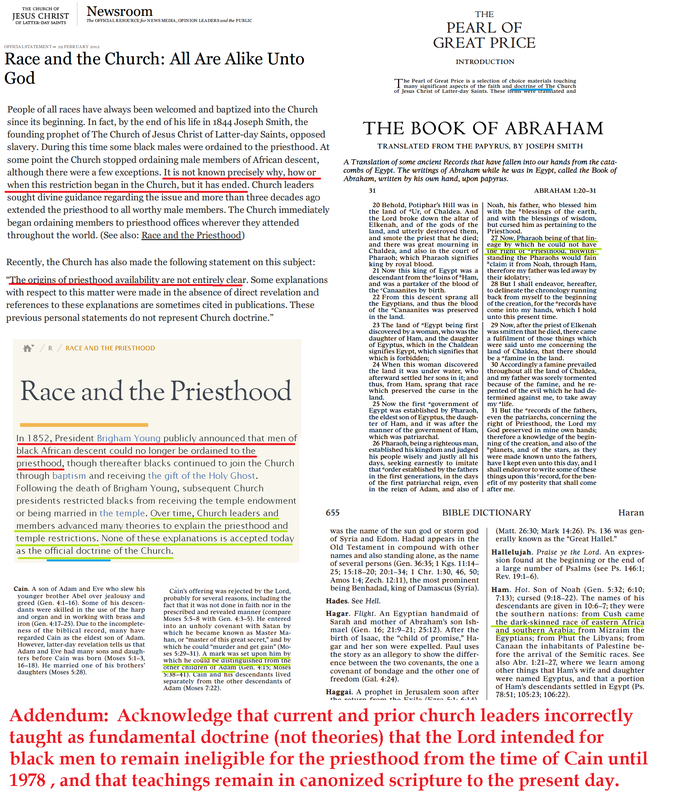 Addendum #3- The Pearl of Great Price Student Manual, The Book of Abraham. Who Is Abraham and When Did He Live? How Did the Church Obtain the Book of Abraham? On 3 July 1835 a man named Michael Chandler brought four Egyptian mummies and several papyrus scrolls of ancient Egyptian writings to Kirtland, Ohio. The mummies and papyri had been discovered in Egypt several years earlier by Antonio Lebolo. Kirtland was one of many stops in the eastern United States for Chandler’s mummy exhibition. Chandler was offering the mummies and rolls of papyrus for sale and, at the urging of the Prophet Joseph Smith, several members of the Church donated money to purchase them. In a statement dated 5 July 1835, Joseph Smith, declaring the importance of these ancient Egyptian writings, recorded: “I commenced the translation of some of the characters or hieroglyphics, and much to our joy found that one of the rolls contained the writings of Abraham. … Truly we can say, the Lord is beginning to reveal the abundance of peace and truth” (History of the Church, 2:236). Use of the word “Translation” here does not denote the typical definition of changing a text from one language to another by expert knowledge. Mormon and non-Mormon Egyptologists agree that the characters on the fragments do not match the translation given in the book of Abraham . Why Did the Prophet Joseph Smith Say He Translated the Writings of Abraham When the Manuscripts Do Not Date to Abraham’s Time? In 1966 eleven fragments of papyri once possessed by the Prophet Joseph Smith were discovered in the Metropolitan Museum of Art in New York City. They were given to the Church and have been analyzed by scholars who date them between about 100 B.C.and A.D. 100. A common objection to the authenticity of the book of Abraham is that the manuscripts are not old enough to have been written by Abraham, who lived almost two thousand years before Christ. Joseph Smith never claimed that the papyri were autographic (written by Abraham himself), nor that they dated from the time of Abraham. It is common to refer to an author’s works as “his” writings, whether he penned them himself, dictated them to others, or others copied his writings later. What Did the Prophet Joseph Smith Do with His Translation? The book of Abraham was originally published a few excerpts at a time inTimes and Seasons, a Church publication, beginning in March 1842 at Nauvoo, Illinois (see Introductory Note at the beginning of the Pearl of Great Price). The Prophet Joseph Smith indicated that he would publish more of the book of Abraham later, but he was martyred before he was able to do so. Concerning the potential length of the completed translation, Oliver Cowdery once said that “volumes” would be necessary to contain it (see Messenger and Advocate, Dec. 1835, 236). In addition to hieroglyphic writings, the manuscript also contained Egyptian drawings. On 23 February 1842, the Prophet Joseph Smith asked Reuben Hedlock, a professional wood engraver and member of the Church, to prepare woodcuts of three of those drawings so they could be printed. Hedlock finished the engravings in one week, and Joseph Smith published the copies (facsimiles) along with the book of Abraham. Joseph Smith’s explanations of the drawings accompany the facsimiles. What Happened to the Mummies and the Papyri? After the death of the Prophet Joseph Smith, the four mummies and the papyri became the property of Joseph’s widowed mother, Lucy Mack Smith. At Lucy’s death in 1856, Emma Smith, the Prophet’s wife, sold the collection to Mr. A. Combs. Several theories have been offered regarding what happened subsequently to the mummies and the papyri. It appears that at least two of the mummies were burned in the great Chicago fire of 1871 (see B. H. Roberts, New Witnesses for God, 3 vols. [1909–11], 2:380–382). In the early spring of 1966, Dr. Aziz S. Atiya, a University of Utah professor, discovered several fragments of the book of Abraham papyri while doing research at the Metropolitan Museum of Art in New York City. These fragments were presented to the Church by the director of the museum on 27 November 1967. The current whereabouts of the other mummies and the other portions of the papyri are unknown (see H. Donl Peterson, “Some Joseph Smith Papyri Rediscovered (1967)” inStudies in Scripture, Volume Two, 183–85). What Is the Significance of the Book of Abraham? The book of Abraham is an evidence of the inspired calling of the Prophet Joseph Smith. It came forth at a time when the study of the ancient Egyptian language and culture was just beginning. The scholars of the 1800s had scarcely begun to explore the field of Egyptology, and yet, with no formal training in ancient languages and no knowledge of ancient Egypt (except his work with the Book of Mormon), Joseph Smith began his translation of the ancient manuscripts, although translation is globally agreed to not correctly describe the record and it is now thought to have been received by some other form of revelation and not linguistic translation . His knowledge and ability came through the power and gift of God, together with his own determination and faith. The book of Abraham reveals truths of the gospel of Jesus Christ that were previously unknown to Church members of Joseph Smith’s day. It also casts a bright light upon difficult passages found in other scriptural texts. Addendum: The Book of Abraham cannot be considered a translation of ancient papyri. Egyptologists agree that the published text in the Pearl of Great Price does not correctly correspond to the hieroglyphics nor the facsimiles, which are therein referenced. Meaning: From a secular perspective, the Book of Abraham represents one of the most potent weaknesses arguing against the divine origins of Mormonism, given that a canonized document purported to be translated and widely understood as such for generations of church instruction, has now definitively been proven be incorrect. From a faithful perspective, the significance of the Book of Abraham and the doctrines therein can still be accepted and believed as a divinely-received revelation, despite it not being a historcially-valid document. This entry was posted in Book of Abraham and tagged Manuals, Pearl of Great Price Manual, Pearl of Great Price Manual Book of Abraham, Sunday School, The Book of Abraham, The Pearl of Great Price on July 8, 2014 by claytonbhess.